Saika Enterprise : 07-14 GMC Acadia 3inch Round Stainless Side Step Bars [S-GMA10P-3] - Contact for Price! 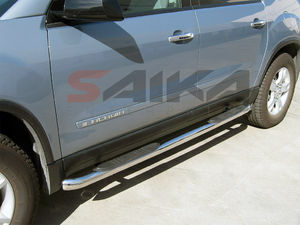 07-14 GMC Acadia 3inch Round Stainless Side Step Bars Contact for Price! Made out of T304 high grade Stainless Steel in 3-inch round tubing design for maximum durability and resistance against rust and corrosion. Mirror polished to a chrome finish. Heavy duty rubber steps on both sides for secure stepping when entering or exiting the vehicle. 500lbs weight support capacity on each side bar. Complete mounting hardware, brackets, bolts and screws are included. These side steps mount straight to the chassis through the supplied brackets using the factory holes with no welding or drilling involved. 5 years or 60,000 miles warranty against rust, corrosion or metal failure through Naxos®. Sold in pair - Both passenger and driver sides are included. Installation might require cutting through the plastic air dam (bumper skirt) to reach the factory chassis holes in a few applications.